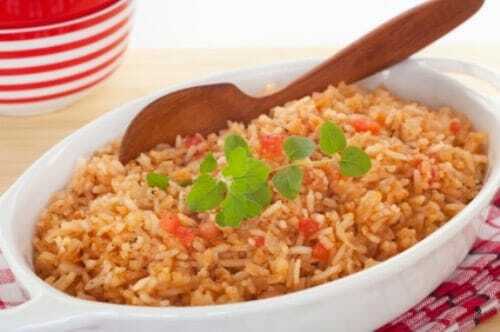 Guadalajara Spanish Rice is so tasty and easy to make. Melt lard into a large, wide pot over high heat. Add rice and bring to a boil in the lard; stir frequently. Cook rice over high heat until golden brown, about 10 minutes. Strain off lard. Return rice to large, wide 3-quart pot. Add water, bell pepper, onion, tomato, chicken base, cumin, pepper and paprika. Cook over high heat 20 minutes until rice begins to expand. Cover with foil and transfer to 350-degree oven for 15 minutes. Remove from oven and mix rice to evenly distribute vegetables.12 servingsRecipe from Houston Chronicle. Go to your butcher shop or supermarket meat department and ask for pork fat trimmings. Cut scraps of meat off. Put fat in a crock pot and melt it down. Strain and pour in mason jars. It will solidify. Voila…lard. Can do the same with beef fat…that’s called tallow. This was so good, and easy to make! I will be making this again. WTH do you buy lard from? You buy it at the grocery store. It is sold near the shortening.